btrfs (butter filesystem) is something that many of us have been interested in for years. Here is a very recent talk from LinuxCon Japan 2014. There is some Japanese at the beginning of the talk, but fear not, it is in English. The presenter is Marc Merlin... who if I remember correctly used to make really extensive LinuxWorld reports back when LinuxWorld still existed. Anyway, enjoy this btrfs update. Here's the slide deck PDF that goes along with the talk. I wish I could find a video for the presentation on LXCF (pdf). Gary Bummer and I made the journey out to Bellingham on the ritual Friday. Gary drove. Thanks Gary! The trip was rather uneventful... except Gary decided to bypass Seattle and take a much more scenic router that goes through a quaint town named Leavenworth, Washington. What's quaint about it? Well, Leavenworth is styled after a Bavarian village. How can you tell that? Well the buildings on the road through town all look like they are in the Alps or something. The lettering used on all of the business signs is in some kind of weird font that is obviously somehow mandated by the place... since even the big box stores and fast food chains have altered signage that uses the city font. Really... even Napa and McDonald's don't look quite right. It was definitely a pretty route with quite a bit of snow in the mountains with occational streams flowing down... (the road followed) a winding river much of the way... and apple orchards. The spead limit was 60 MPH but there was very little traffic and we hit the Seattle area just North of Everett I believe... so even when we got on the 6 lane highway, it wasn't that crowded. It difinitely made for a much more pleasant trip. Gary took the same route home last year but this is the first time we took it on the way up. We hit Bellingham right at 9PM so we missed the oriental food place we usually go to for spicy chicken but hopefully we'll do that for lunch today (Saturday) and/or Sunday. There was a Board Games event Friday evening in Fox Hall (at Hampton Inn where we are staying) sponsored by Fedora. Fox Hall was chopped in half with a divider and the half that the event got was packed. Every table was full of people. There were some snacks including cookies, crackers, chips, fruit, cheese and sliced meats. Free soft drinks and some wine was also available. Someone had brought in a bottle of Black Vodka to share. I'm wondering if that was Monty W.? Gary and I grazed the food a little but spent the whole time standing since we had been sitting about 14 hours during the trip. We really weren't in the mood for board games... as I've only played the traditional Milton-Bradley type with my kids... and that was not what these board games were at all. :) We did get a cool pack of Fedora playing cards. At the show today and tomorrow I hope to pick up a few more packs (of Fedora playing cards) and other SWAG to share with the BozemanLUG folks. One sad note about this year though... I couldn't find my digital camcorder so I won't be recording the presentations I go as in the past. I hope but don't expect some recordings to made of various presentations by others. The Saturday Night party is going to be at the Sparks Museum again this year and there will be homebrew beer there. Luckily Gary brought his camera so we'll get some pictures at least. More later. I got all of my machines updated and was sure to restart all services that use openssl. How about you? How about an OpenVZ CentOS Variant? I've used RHEL, CentOS and Fedora for many years... and as many of you already know... back in January, CentOS became a sponsored project of Red Hat. For the upcoming CentOS 7 release they are going beyond just the normal release that is an as-perfect-as-possible clone of RHEL. They have this concept of variants... where Special Interest Groups (SIGs) are formed around making special purpose builds of CentOS... spins or remixs if you will. I don't know a lot about it yet but I think I have the basic concept correct. Although reporting is optional, the popularity of CentOS as both an OpenVZ host and an OpenVZ container surely has to do with the fact that the two stable branches of the OpenVZ kernel are derived from RHEL kernels. Wouldn't be nice if there were a CentOS variant that has the OpenVZ kernel and utils pre-installed? I think so. While I have made CentOS remixes in the past just for my own personal use... 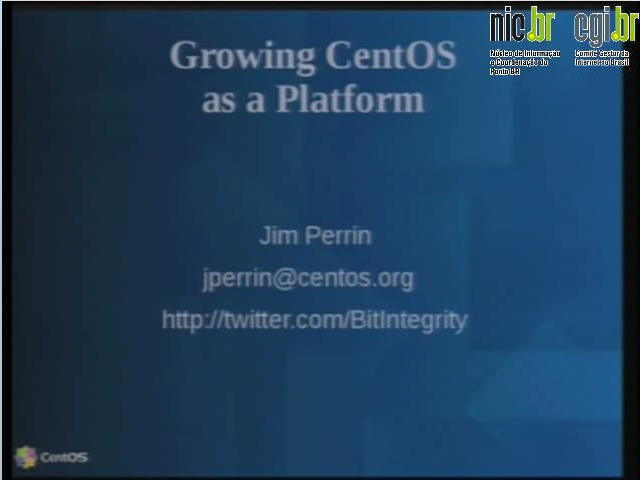 I have not had any official engagement with the CentOS community. I was curious if there were some OpenVZ users out there who are already affiliated with the CentOS Project and who might want to get together in an effort to start a SIG and ultimately an OpenVZ CentOS 7 variant. Anyone? I guess if not, I could make a personal goal of building a CentOS and/or Scientific Linux 6-based remix that includes OpenVZ... as well as working on it after RHEL7 and clones are released... and after such time the OpenVZ Project has released a stable branch based on the RHEL7 kernel. I will acknowledge up front that some of the top CentOS devs / contributors have historically been fairly nasty to OpenVZ users on the #centos IRC channel. They generally did not want to help someone using a CentOS system running under an OpenVZ kernel... but then again... their reputation is for being obnoxious to many groups of people. :) I don't think we should let that stop us. Update: Wow, looking here, they already have OpenVZ listed as being of interest in their Virtualization SIG. I mention this because I'm a big KDE fan but KDE-only distro spins do not include my preferred browser (Firefox) nor my preferred office suite (LibreOffice, not that I use an office suite much) because they aren't QT-native applications. While LibreOffice does a better job of integrating with KDE than Firefox does, both drag with them quite a bit of GTK baggage... which is considered "bloat" by many spin makers. Ok, so a spin doesn't have to fit on a CD anymore because everyone has a DVD reader, right? So why not take advantage of that and not be afraid to ship a 1.4 or a 2 GB live image? Korora is a really nice Fedora remix and they have a KDE spin... and they break rule A by including Firefox and LibreOffice but they aren't fond of breaking rule B. And they aren't afraid of having a larger image size either. I guess I'll have to remain happy by continuing to create my own remix with most desktops included as well as many, and often redundant, desktop applications that use a variety of widget sets. 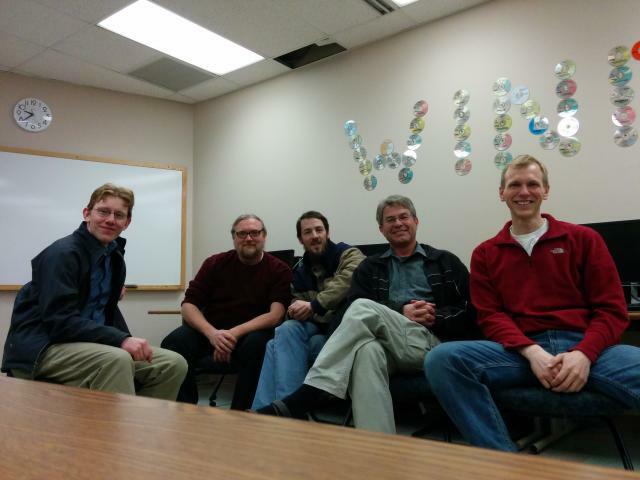 Here's a picture taken from the January BozemanLUG meeting. Jeff Sharkey was visiting and took the picture with his smartphone. There be handsome devils. Kevin was also in town for the holidays as he moved to Missoula for work a while back.